Ginger is a spice that’s been used for centuries in Asian territories for its healing properties as well as the zing it adds to dishes. These ginger essential oil uses are well known for turning back the hands of the clock where your inner and outer health is concerned. Ginger essential oil is used to treat more than a dozen very different mental and physical conditions. Zingiber officinale (the Latin name for ginger) is very healthy for you whether used fresh or steaming the roots of the ginger plant. The resulting essential oil from this steaming process delivers a spicy and sweet scent and a host of health benefits. Ginger can help your digestive system establish regularity. Often used in cooking, especially in Asia, ginger offers health benefits primarily that serve digestion. For instance, the oil possesses natural soothing and relieving properties that help calm occasional nausea, upset stomach, or motion sickness. In fact, carrying a bottle on a long road trip or on a rocking boat can ease the most sensitive stomach. The oil’s strong digestive properties, along with its natural ability to flavor everything from baked goods to stir fry dishes, make it one powerful agent to have on hand when you’re throwing together a meal. The most potent form of ginger is, in fact, the essential oil since it contains a concentrated amount of gingerol, a highly potent antioxidant and anti-inflammatory agent. This makes it the best form of the spice to be used as a medicine. Ginger essential oil is a warming essential oil that works as an antiseptic, laxative, tonic and stimulant. The oil is also known as “the oil of empowerment” and when diffused can bring on a feeling of inspiration and well-being. To relieve the occasional upset stomach, add 1-2 drops of ginger essential oil to a glass of drinking water and take internally. For motion sickness or nausea, add a drop or two to your hands, cup and inhale, for stomach-calming relief. To serve the digestive tract, dilute 1-2 drops with a carrier oil like coconut or olive oil and apply topically to the stomach and the soles of the feet. Lastly, you can add ginger oil to any number of dishes for its pungent and spicy flavor. If you’re able to get your hands on ginger root itself, you can also grate it and steep it in hot water to make a tea that will soothe your stomach. Because of its anti-fungal properties, ginger essential oil provides great relief for colds, flu, asthma, bronchitis and other respiratory illnesses. Ginger oil removes mucus from your throat and lungs and acts as an expectorant which makes it a particularly helpful essential oil for colds and congestion. Ginger oil is also an anti-oxidant which makes it a powerful remedy for inflammation. It has been shown to help reverse the effects of aging by lowering cholesterol and removing free radicals in the body. A flagging libido can be boosted rather quickly by the topical application of ginger essential oil. Apply to the lower abdomen for a healthy libido boost, effective for both men and women. You can also diffuse ginger oil to experience the same benefits, just not as rapidly. Those with sensitive skin should always dilute the oil with a carrier oil. Avoid touching the eyes, ears, and other sensitive areas with the oil. People who are nursing, pregnant, or are receiving medical attention should consult their physician before use. Additionally, make sure to store the oil away from children. 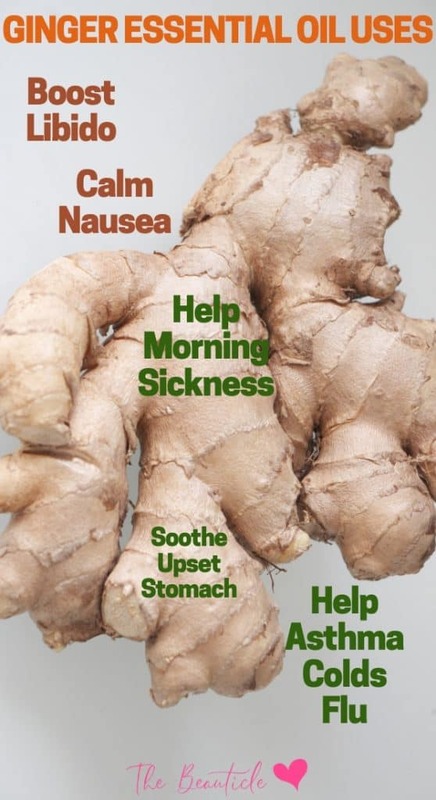 As a treatment for morning sickness and vomiting, ginger essential oil is very effective. Simply mix one drop to a glass of water, stir and drink slowly. Diffusing is also recommended, though it is not as effective as ingesting ginger oil for treating morning sickness in some women. Try this recipe below to make a morning sickness tea that’s soothing for pregnant women. Relieve morning sickness with this tasty and stomach-calming blend. Simply stir all ingredients in a glass and drink each morning, right when you get up. Try this Asian inspired Egg Roll in a Bowl recipe fora ginger-infused meal.